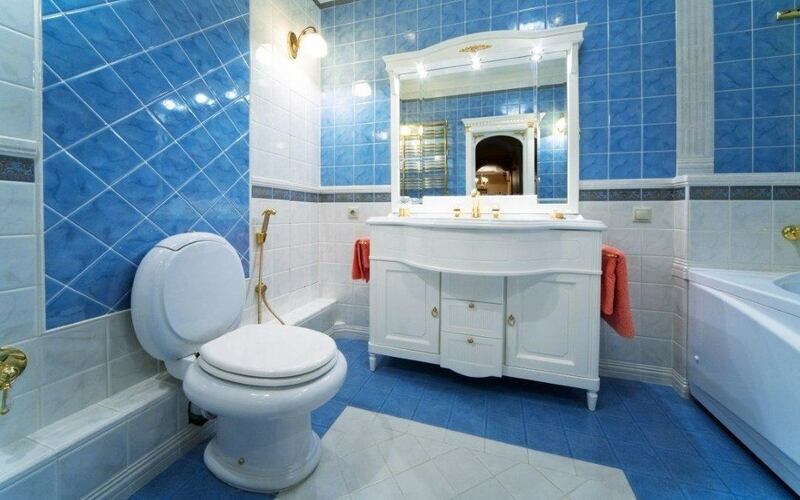 A sparkling tub, pristine toilet bowl, and shiny sink make bathroom visits much more pleasant. However, most of us don’t enjoy cleaning the bathroom. Fortunately, there are numerous cleaning bathroom tips you can use to make this dreaded job easier. These tips will help you do a professional bathroom cleaning job easily. Real Simple suggests soaking your showerhead in white vinegar. Fill a plastic shopping bag with enough white vinegar to submerge your showerhead and tie the bag in place. Allow the showerhead to soak overnight. Run the water in the morning to rinse. If you have a shower curtain, wash it in your washer with your regular detergent. Add a few old towels to the load to protect your curtain. You can use a white vinegar and baking soda paste to clean shower doors. Combine one cup of baking soda with a few drops of distilled white vinegar. Put the paste onto your shower door. Let the paste sit on your sower door for one hour before you use a microfiber cloth to scrub it. Rinse the door off and dry it with another microfiber cloth. Productive and Pretty recommends using a Dawn and vinegar spray to clean your tub. To make the spray, combine equal parts Dawn dish soap and warm vinegar in a spray bottle. Shake the bottle to mix the solution, and spray it onto your tub and its walls. Allow the solution to sit for a while before rinsing it off; there’s no need to scrub. An essential part of bathroom cleaning is sanitizing your toilet. Before you begin cleaning the toilet, remove anything that sits on or near it so that you don’t accidentally get chemicals or toilet water on these objects. Squirt your toilet bowl cleaner into the toilet, getting it as close to the rim as possible. While the toilet bowl cleaner soaks in, you can work on cleaning the toilet’s exterior. Use disinfecting wipes or a multi-purpose cleaner and paper towels to clean the outside of your toilet, from top to bottom. Don’t forget to clean your toilet seat and handle. Use your toilet brush to clean the inside of the toilet. Here is one of the best cleaning bathroom tips you can use if your toilet has stains that cannot be removed with your toilet brush. Remove the water from your toilet, and place vinegar-soaked paper towels onto the stubborn stains inside the bowl. Allow the towels to sit on the stains for two hours. The vinegar should remove the stubborn stains during this time. Pour some baking soda or white vinegar down the drain in your bathroom sink, and flush it with hot water. You can use disposable disinfecting wipes to clean the faucet and its handles. Real Simple recommends using floss to clean the narrow gaps where your faucet and taps meet the sink. Cleaning the grout is perhaps the most dreaded part of bathroom cleaning, but it’s important for keeping a sanitary bathroom. To clean your grout, LynneJean Cleaning recommends to dunk a grout brush into bleach, and scrub any areas that need attention. When you’re finished, rinse well. Remember to ventilate the room. Seal your grout every six months to help prevent grime and moisture from seeping in. Better Homes & Gardens recommends mopping your floor with one-fourth cup of vinegar and one tablespoon of dish soap mixed with hot water. After you’re done washing and rinsing your bathroom floor, dry it with a towel for extra sparkle. Cleaning the bathroom may be one of your least favorite household chores. However, not only will these bathroom cleaning tips save you time and effort, they will make your bathroom look like its had a professional bathroom cleaning job done on it.